Lovecraft praised Robert E. Howard to his face (via correspondence). 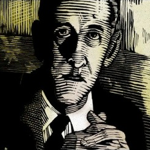 Of course, HPL could have cut off corresponding at any time (he didn't). In fact, the Old Gent initiated it all. That correspondence started 85yrs ago this year. Influences went both ways. Aside from Realms of Cthulhu for Savage Worlds (and possibly more so), I would heartily recommend The Savage World of Solomon Kane. It and its supplements really capture the spirit of the character and the world of Kane. The plot point campaign has some definite Lovecraftian influences. So, you get some great action, swashbuckling adventure and a good dose of horror, to boot. Solomon Kane is probably my favorite of all REH's characters. REH is one of the unbreakable cornerstones of my creative foundation. His work never leaves me. "A book of Conan stories would certainly be a very welcome item, & I hope such a thing can be published some day. It ought, I think, to be a pretty large & inclusive thing--& might form quite a problem to a publisher with limited equipment. It seems to me that for an immediate volume a collection of Howard's best stories--irrespective of their membership in the Conan cycle--would be the wisest venture. REH's best weird tales, without question, were the short 'King Kull' series--though perhaps some of the Conans & Solomon Kanes, plus the recent 'Black Canaan', fall into that category. Certain Howard enthusiasts ought to be consulted about the contents of such a book--[ E. Hoffman] Price being especially well qualified to pick selections. Financing would be a rather hard problem (I'm utterly broke! ), but a large number of small subscriptions secured through advertisements in the fan magazines might help. Your scale of estimated prices is very helpful in forming an idea of the problem--as is the set of paper & cover samples. A 100-page volume ought not to be impracticable in the end--& might conceivably hold all the 'King Kull' tales. Art work can sometimes be secured quite reasonably--Utpatel having done four drawing from my 'Innsmouth' for only $15.00. A sketch or line drawing of REH would make a good frontispiece--& as a model I'd suggest one of the 1931 snapshots (I could lend a small print). These are more typical, I think, that the stouter, moustached snaps of REH's last days. But all these points could be discussed by the editorial board--pictures, title, scope size, selects, &c. I'd suggest your getting in touch with Price on the subject, & also with REH's father." Obviously, HPL was quite keen on the idea of a volume of Howard's best tales. He expressed his appreciation for Black Canaan more than once. In fact, he may've helped brainstorm the plot (to a small extent). "...It seems to me that for an immediate volume a collection of Howard's best stories--irrespective of their membership in the Conan cycle--would be the wisest venture. REH's best weird tales, without question, were the short 'King Kull' series--though perhaps some of the Conans & Solomon Kanes, plus the recent 'Black Canaan', fall into that category. Certain Howard enthusiasts ought to be consulted about the contents of such a book--[ E. Hoffman] Price being especially well qualified to pick selections." Indeed. He'd handed Arkham House the outline for Skull-Face and Others: 5 Conans, 4 Solomon Kanes, 2 Kulls, 2 Brans, and a healthy handful of other great stories (including "Black Canaan"), with an intro by EHPrice. There's also Barbarians of Lemuria and Jaws of the Six Serpents which do an equally good job of Conan style Swords and Sorcery games. Did Derleth have access to the Shepherd letter, I wonder? Or did he just make a lucky guess? Also of interest might be D101 Games' Crypts & Things OSR S&S game. "Your mention of Houdini interests me. You blame him for being a showman when he might have been, in your opinion, a scholar, scientist, or philosopher. How do you know he would have derived more pleasure out of being a scholar, scientist or philosopher than he did as a showman? Now, donâ€™t get to thinking again that Iâ€™m questioning the superiority of these things over showmanship. Iâ€™m simply questioning the assumption that any man would get more satisfaction out of being a scholar, scientist or philosopher, than he would out of being something else. As a born showman, Houdini was undoubtedly happier as the supreme artist of his profession, than he would have been in anything else. You donâ€™t take differences of temperament into consideration. Because scholarship, science and philosophy are superior to other things, doesnâ€™t necessarily mean that any man of intelligence would be happier following one of these pursuits than at anything else." HPL created the Arkham Sanitarium (not "Asylum"). Howard had Justin Geoffrey (a character he created) die in a "madhouse", but that was likely one in the Catskills/upstate New York, which is where Geoffrey's family lived. I'm glad "Dave" cornered Denny O'Neill as to the origin of DC's Arkham Asylum. Jack C. Harris appears to have been the one to throw it out there, but I have a hard time believing that Julius Schwartz and Wandrei had zero influence upon that happening. [several texts need rewritten (as does the wiki entry). I would heartily recommend The Savage World of Solomon Kane. It and its supplements really capture the spirit of the character and the world of Kane. The plot point campaign has some definite Lovecraftian influences. So, you get some great action, swashbuckling adventure and a good dose of horror, to boot. I managed to get hold of the Savage World of Solomon Kane rulebook and the Path of Kane supplement. The scenarios seem to be short and lethal, especially the ones in the rulebook. Having had my witch-hunter character mortally wounded twice (once by a zombie and once by a giant rat), I'm actually more scared of getting into a fight in Solomon Kane than in Cthulhu! Are the Savage Foes and Traveler's Tales supplements worth getting? I like Savage Foes but wasn't overly impressed with what I saw of Traveler's Tales. Also, Traveler's Tales is the only Solomon Kane RPG book that's not a nice hardcover My only problem is that after having experienced it as a player a couple of times I'm not all that enamoured with the Savage Worlds system. It's a fun and beautifully produced RPG though. Note that this is a background, not a separate RPG. There are different versions for D&D, Savage Worlds, and 13th Age. You can get PDF versions of the books from DriveThruRPG.com. Could you tell me what specifically is good about Savage Foes? "Yes "Robert E. Howard is a notable author" more powerful & spontaneous than even he himself realises. He tends to get away from weirdness toward sheer sanguinary adventure, but there is still no one equal to him in describing haunted cyclopean ruins in an African or Hyperborean jungle. He has written reams of powerful poetry, also - most of which is still unpublished." Otto Binder (who may've written the last chapter of Almuric) writing about REH [and HPL]. The eldritch monument in this REH poem can't be the Black Stone and its location has never been determined. Strange were the kings and grim the deeds that the pallid moon looked on. And smoke went up from ghastly shrines where writhing victims died. Till an angry God hurled up the sea against the shuddering land. And they set a pillar on a hill for a symbol and a sign. And dawn looked down on a silent world and the blue unbroken deep. Of the veil that crushed, so long ago, the world beneath its heel. Inhuman kings await the day that shall break their chains of sleep. A pillar stands like a sign of Fate, in subtle warning still. Leers in the glare of the tropic sun and the cold of the leprous moon. Till Hell roars up from the black abyss and horror swoops behind. "We that were lords of all the earth, shall rise and rule again." When the ages give their secrets up and the sea gives up its dead. (1) I picked up a SAVAGE WORLDS rulebook and have started reading more about the game. Looks like it's not too hard to run and there is a lot of good material out there for the game. (2) I bought a copy of THULE for 5E and it looks okay but didn't really grab me that much. It's mostly sitting on the shelf. (3) I like all of the SOLOMON KANE resources for the game, but I'm biased since SK is one of my favorite Howard characters of all time. 1) The d20 Conan game, with more Mythos stuff gleaned from the d20 CoC book (creatures and spells.) Some conversion is required as d20 Conan has some mechanical differences w.r.t. "standard" d20 stuff. 2) Stormbringer 4e for character rules (professions, equipment etc. ), with CoC for Mythos stuff (creatures and spells). This combination works almost seamlessly. The Demon Magic supplement for Stormbringer has some suggestions for the use of Sanity in the game. Note also there are Cthulhu Dark Ages and Cthulhu Invictus, which could also be used mostly "as is", although I haven't tried them.